While students may be rounding the corner to Thanksgiving break, there’s still a full slate of fine arts events on deck over the next few days. The “Art Minor Spotlight Exhibit” opens in the Schaefer Gallery Friday, the Gustavus Artist Series hosts mezzo-soprano Sarah Leuwerke Saturday evening and both the Adolphus Jazz Ensemble and the Gustavus Jazz Ensemble come together in one jam-packed concert Sunday afternoon. Not to be outdone, the Gustavus Philharmonic Orchestra performs its fall concert Sunday, and Monday night features the opening reception of the “Charles E. Burchfield: Oh My Heavens” exhibition in the Hillstrom Museum of Art. The Art Department presents the “Art Minor Spotlight Exhibition” in the Schaefer Art Gallery featuring work from students Ashley Studsdahl, Brenna Tuttrup, Caden Killion, Cassie Juberien, Emma Gasterland-Gustafsson, Emma Jones, Signe Jane, and Yesenia Hidalgo. The exhibition will be open to the public November 15 to December 10. 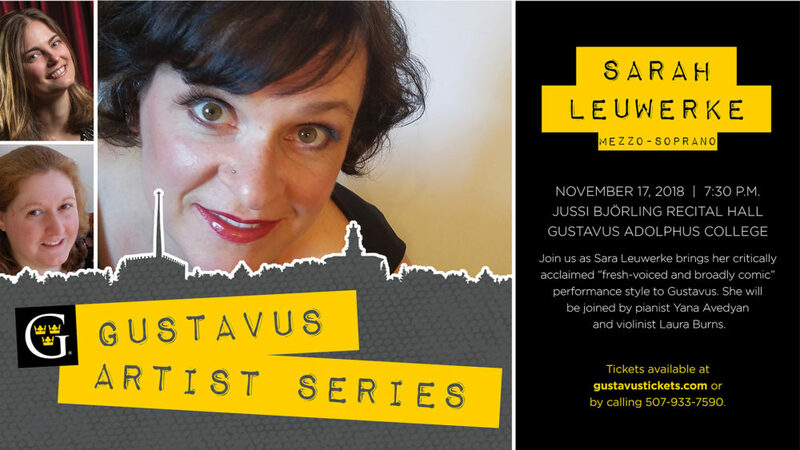 The Gustavus Artist Series continues with a voice recital by mezzo-soprano Sarah Leuwerke. Leuwerke has performed with symphony orchestras and operas around the country. She will be performing standard works by Benjamin Britten and Gerald Finzi, while also featuring female composers with a premiere of a new work by Veronika Krausas. She will be joined by pianist Yana Avedyan and violinist Laura Burns. The Adolphus Jazz Ensemble directed by Masa Ishikawa and Gustavus Jazz Ensemble directed by Dave Stamps present their fall jazz showcase. The performance will include a wide variety of jazz charts including favorites from Duke Ellington, Ella Fitzgerald, and Fred Sturm. The Gustavus Philharmonic Orchestra present its fall concert. Under the direction of Justin Knoepfel, they will perform works by Eric Whitacre, W.A. Mozart, Jean Sibelius. Artist Charles Burchfield has been called one of the great American masters of the 20th century. This exhibit features 50 of Burchfield’s watercolor paintings of the sky, moon, planets, and stars, along with three pieces belonging to the Hillstrom collection. “Charles E. Burchfield: Oh My Heavens” is on display November 19–February 1 at the Hillstrom Museum of Art.